In May-June 2009 in known Pasadena Auditorium, Los Angeles, USA, took place first meeting of the outstanding Argentine bandoneonist and composer Walter Rios, singer Mariel Dupetit and the Cadence Ensemble from Armenia. They took part in two big shows dedicated to Tango and Astor Piazzolla. 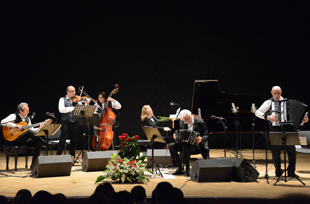 During the following years there have taken place talks regarding necessity of establishing an Argentine-Armenian Project and finally the project became reality at Yerevan International Tango Festival: on the 20th April 2013 maestro Walter Rios, Mariel Dupetit and Cadence Ensemble gave unforgettable concert at Aram Khachaturian Hall in Yerevan, Armenia. The ARGARM Tango Project starts its existence and it has good prospects to become one of the most attractive international music projects of our times. Walter Rios, the world famous bandoneon player, composer, arranger and director, was born in 1942 in the town of San Eduardo, Santa Fe province in Argentina. He took his first music lessons with his father, Don Santos Rios, at the age of four. He started appearing on stages with his father’s orchestra when he was only six years old. Walter continued his musical studies with Antonio Rios in the city of Rosario and then entered the National Conservatory of Music in Buenos Aires in 1960. He lived in France for three years, performing recitals and recording records with well known French and Argentinian musicians. He was also invited to London by Professor Mariano Mores to give concerts for the Queen of England in Buckingham PalaceHe is the founder of the Tango Trio and co-founder of Quinteto de Musica of Buenos Aires. Rios has performed around the world with his own ensembles and orchestras as well as with other national musical groups and philharmonic orchestras and numerous tango artists such as Oscar Alonso, Alberto Castillo, Hugo del Carril, Susana Rinaldi and others. Maestro Rios has recorded the soundtracks for a large number of Argentinian and Latin American films, working with directors and arrangers such as Oscar Cardozo Ocampo, Mariano Mores, Leonard Baccardi and Lalo Schiffrin. He participated in the show “Tango Brujo” in Spain and Argentina and was the director of the show “Forever Tango” in the United States and director of the Buenos Aires Tango Company in Japan, among others. He has recorded solo records as well as albums with his wife, the famous tango singer Mariel Dupetit. Walter Rios is the recipient of many honors, such as “Outstanding Personality of the City of Buenos Aires” for his outstanding 60-year career in music and for representing Argentinian music to the world and Honorary Academician of the Argentinian National Academy of Tango. Mariel Dupetit is an internationally known vocal performer of Argentine and South American music. Her first album “Mariel Dupetit” with the theme song dedicated to the resort city of Mar del Plata, “A City for Living”, was recorded under the CBS label in 1986. The song became Mar del Plata’s theme song. Mariel has also been named Cultural Ambassadress of Mar del Plata. Her second album was entitled “Let us run to love”. She has shared the stage with Armando Manzanero, Luis Aguile, Antonio Prieto, Walter Rios, Estela Raval, Leonard Baccardi, Anibal Berrautte and others. She was a special guest in a show produced by Eber Lobato at the Tropigala Club in Miami, Florida as well as in the presentation “A Tribute to Piazzola” at the Museum of Modern Art in Miami, also representing Argentine music at the reopening of the Lyric Theater of the same city. She has performed in the United States, Mexico, Peru, Bolivia, Chile, Brazil, Spain and Italy. Ms. Dupetit was Director for Development of New Talent at Jaleo records and Publishing and artistic advisor in Spain and Mexico. She was also a voting member of “The Recording Academy” and the “Latin Recording Academy” which are the entities that bestow the Grammy Awards. In 2006, he CD “Tangos” was released Universal Records in the United States. The following year, she was invited to Argentina by Maestro Walter Rios to participate in the tango musical series “Ensayos”. Together with Maestro Rios, Mariel recorded the album “Afternoon in July”. This was the first time that Maestro Rios had recorded an album with a singer, creating a flawless repertoire of tangos that provide a climate of the deepest emotions for listeners. In 2009, she was guest singer with the Walter Rios Octet in two concert tributes to Astor Piazzola at the Pasadena Civic Theater in California. In 2010, she participated in the show “dreams and Loves” with Walter Rios at the Alliance Francaise in Buenos Aires as well as at the Teatro Ideal in the city of Venado Tuerto. She has continued to perform with Maestro Rios’ musical ensembles in Argentina and internationally. Mariel is an artist of great sensitivity and strong stage presence, captivating the emotions of her audience with every number she performs. Beijing (China). In 2008 the ensemble performed concerts in Montreal (Canada), Nicosia (Cyprus) and Beirut (Lebanon). The CD “Expressia: Armenian Metamorphoses” received the Luxemburg “Pizzicato” Music Magazine’s prestigious Supersonic Award in November 2008. In May-June 2009 the ensemble gave two performances at the Pasadena Auditorium (Los Angeles, USA) and London (UK). In October 2009 it gave a concert at the Parnassus Hall in Athens and took part in the Dimitria Festival, Thessaloniki (Greece). In April 2013 the Cadence Ensemble within frames of Yerevan International Tango Festival have performed two concerts in Gyumri and Yerevan with prominent Argentine bandoneonist and composer Walter Rios and singer Mariel Dupetit. Rodrigo, Mikrotikos as well as Spanish flamenco, Latin American music, works and arrangements of modern composers. In September 2012 following his nomination by Cadence Hakob has granted the lofty title of Merited Artist of Armenia by Presidential Decree. Hakob has 4 CD of his own and has participated in numerous recording projects by known artists. In September 2012 after being nominated by Cadence, by Presidential Decree, Varazdat was awarded with the Movses Khorenatsi medal, one of the highest cultural awards of the Republic of Armenia. Varo has 2 CD and has participated in numerous audio and video recording projects by known Armenian artists.